The Tony Award-winning 2014 Broadway musical Fun Home is an inspired reverie of heartbreak and elation, all set loose by an honest look back at growing up. The autobiographical story is adapted from Vermont resident — and current cartoonist laureate — Alison Bechdel's graphic novel of the same name. With inventive staging that is itself a delight, Vermont Stage presents the show's regional premiere in Burlington's FlynnSpace. Lisa Kron's book and lyrics preserve the nuances of Bechdel's characters while unfolding the story over 100 exhilarating minutes. Jeanine Tesori's brilliant music connects the emotional waypoints of a journey through memory. Three actors portray Alison, at ages 9, 18 and 43. The grown Alison glides in and out of scenes, observing, writing and drawing her memories. The story is her account of a 1960s childhood with a difficult father, and of college years in which her happy realization that she's gay coincides with the tragic discovery that her father, Bruce, concealed his homosexuality and most likely took his own life. Bruce teaches high school English and runs a funeral home that the family casually calls "fun home." Bruce's free time is spent ruthlessly restoring the family's Victorian house and instilling aesthetic taste in his three children. There's love in this whip-smart family, but it takes elusive forms. If it seems a stretch to convert a story told in pictures to one told in song, the logic lies in the nonlinear quality of memory that both mediums capture. The memoir relies on pictures captioned with contrasting recollections — juxtapositions in the space of a graphic panel. 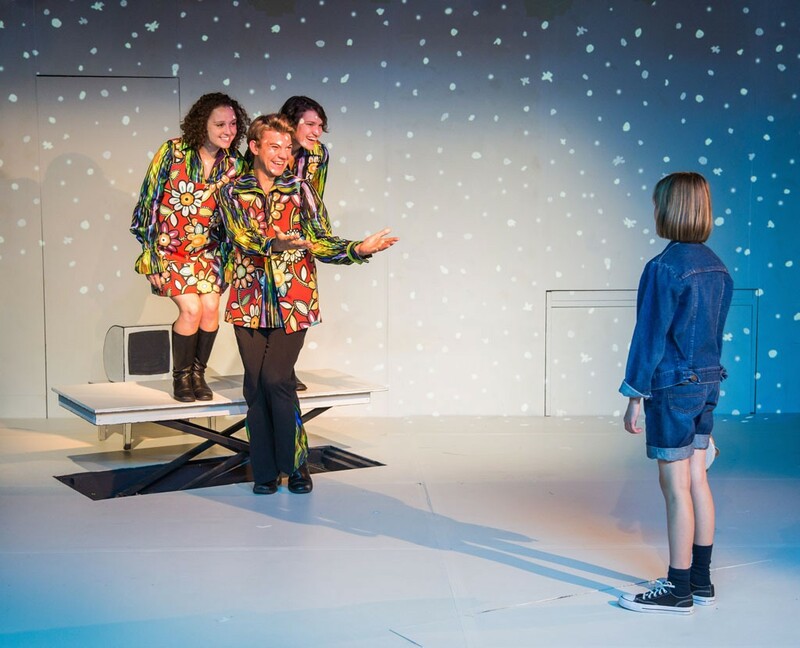 The musical does so in time through counterpoint of music, speech, action, song and characters that move through different locations and multiple ages. The audience has the pleasant puzzle of seeing the contrasts resonate just as grown Alison strains to. Ultimately, both the book and the musical describe memory by tumbling together multiple means of expression. 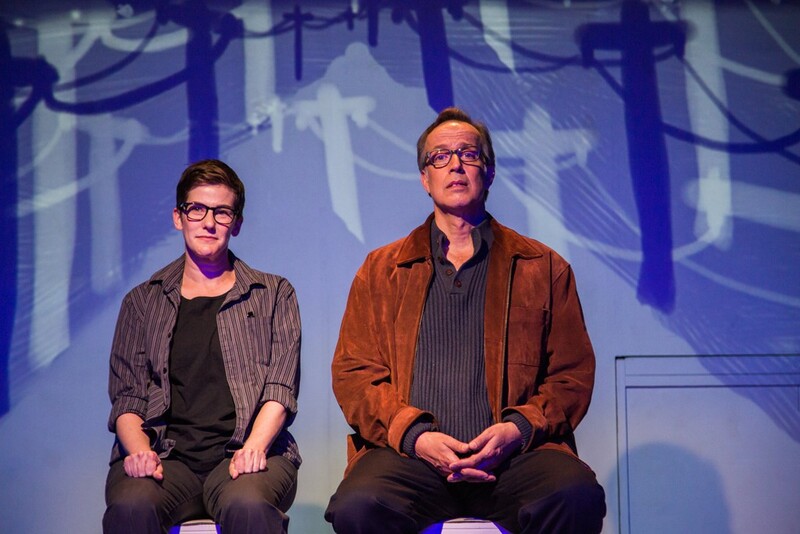 Like memory, Fun Home teeter-totters between joy and sorrow. Alison's exultant first sexual experience contrasts with her father's desperate, have-a-glass-of-sherry seduction of an underage boy. Young Alison and her two brothers make up a hilarious fake commercial for the funeral home, sung to Tesori's peppy tribute to disco and Motown. That scene parallels a number that builds to a near frenzy of contrapuntal divergence, as the kids and mom frantically clean house to suit dad's imperial standards. The energy is thrilling, but the reason for it is Bruce's tyrannical will. Fun Home maintains a lovely balance of tenderness and irony. It's exuberant in the musical comedy tradition, with the big moments of joy coming from Alison's two wonderful discoveries about her sexuality. But it never skirts darkness — both Alison and Bruce face the crucial problem of accepting who they are. Tesori's melodies soar but carry poignant complexity. Insistent rhythmic lines drive the pace, while repeated musical motifs touch on the anchoring points of memory. Thanks to the score and Robin Fawcett's direction, the transitions from speech to singing are so elegant that every word is made musical. Fawcett's lighthearted directorial touch lets laughs overflow, but she's equally keen on building nuanced relationships. John Jensen opens up Bruce's dark corners, portraying a father who delights and disappoints, loves and hurts. A solid singer, he gives us a wrenching look into Bruce's interior life in his finale song. Lulu Barr-Brandt plays 9-year-old Alison with her eyes wide open to the world. In the triumphant "Ring of Keys," she sings about her first sexual role model: a cool, take-charge woman. Barr-Brandt evokes the thrill of self-awareness in an uplifting awakening. Elise Killian, as 18-year-old Alison, shows the scary steps between flustered and confident. Her just-right nervousness at her first feeling of sexual attraction explodes into joy in the shout-to-the-rafters "Changing My Major." As Joan, Alison's girlfriend, Shea Dunlop is positively magical as she unleashes an invitation in the form of a sly smile. Moira Stone plays the mature Alison in constant, loving engagement with the events she's recalling, participating through songs and commentary. As Alison's mother, Gina Fearn skillfully hides her character in Bruce's shadow, until what she's suffered alongside him finally becomes clear. Fearn's evocative performance of "Days and Days" describes the sad bargain she made. The young men who attract Bruce are all smartly played by Owen Leavey. Luke Fitzgerald and Rowan Williams play Alison's young brothers, showing the bright side of this idiosyncratic family with in-joke enjoyment. Fawcett and scenic designer Chuck Padula developed staging that's effective and eye-popping in its wit. Faced with creating 15 locations in a small space open on three sides, Padula uses the single wall for projections that echo Bechdel's drawings. Scene by scene, backgrounds of rooms are delineated by projected artwork created by Anne Barrett. Three-dimensional elements are just as clever. A spinet piano has a keyboard that pulls out of the back wall, and sofas and beds rise up from the floor on ingenious lifts embedded in the stage platform. The occasional piece of real furniture is as blank-page white as the wall, with firm black lines marking its edges. A chair is emphatically a drawing of a chair in this world that Alison sketches from memory. Musically, the production is impeccable. Musical director Randal Pierce developed sensitive, full orchestration using violin, cello, guitar, reeds, bass, drums and percussion. Pierce plays keyboards and conducts six talented musicians. The sound mix positions the vocals for lyrical clarity, while the instruments come through at full intensity. Fun Home bypasses every musical formula to go straight to the audience's heart with tenderness and wit. Alison has the courage to embrace her sexuality and the good fortune to live at a time when closet doors started opening. Bruce is not as fortunate in time or in temperament. Fun Home tells their stories with compassion and gives viewers a reason to remember their own families — perhaps with a little more love. The original print version of this article was headlined "Home Coming"